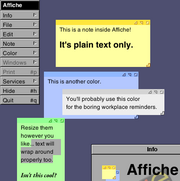 Affiche is a little application that allows people to "stick" little notes on their computer desktop. The goal of this little application is to provide a good example on how to develop cross-platform applications between GNUstep and Apple Mac OS X while providing a useful application at the same time. This page was last modified 00:41, 22 February 2019.